Add the stock and rice to a large pot and simmer, covered, for about 30 minutes. Start with medium low heat, but reduce to lower heat when the stock is visibly reduced. Stir occasionally (more frequently as the stock is reduced) so the rice doesn’t stick to the bottom of the pot. Add the vegetables, cover and simmer for additional 10 minutes until the vegetables are soft. 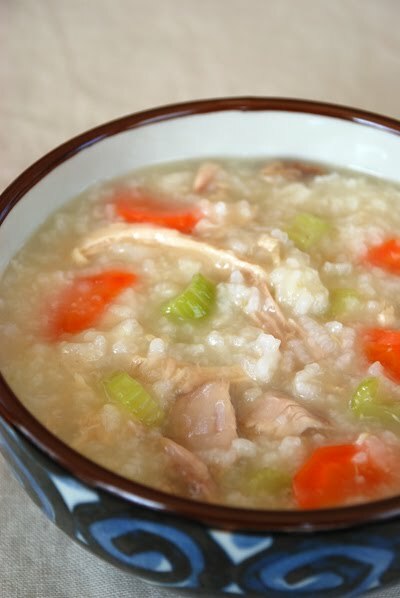 (At this point you can adjust the consistency of the porridge to your taste by adding more stock or water.) Since the chicken is already cooked, stir in during the last few minutes of simmering. Add salt and pepper to taste. I also add condiments like a egg to the broth, green onions, chile paste,squeeze of lemon or lime and fish sauce.